SEATTLE, Jan. 6, 2017 /PRNewswire/ -- Hot on the heels of its acquisition of California-based airline Virgin America, Alaska Airlines is debuting a complimentary new service to help fliers stay connected with friends and loved ones on the ground. Beginning today, guests on Alaska's Gogo-equipped flights can use iMessage, WhatsApp and Facebook Messenger to send greetings from 35,000 feet - for free. 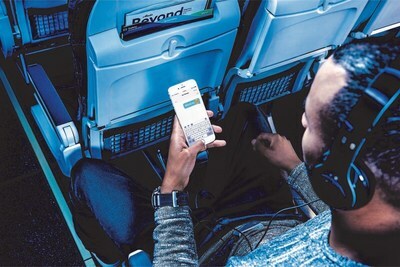 "We're celebrating the new year – and our new, bigger airline – with the rollout of new customer-friendly enhancements on Alaska-branded flights, starting with Free Chat," said Andrew Harrison, Alaska Airlines' executive vice president and chief commercial officer. "We know that staying in touch while on the go is essential to our guests, many of whom don't need full Internet access. Free Chat is a great way to keep that connection alive without breaking the bank. And yes, it's fully emoji-compatible." Free Chat is the first of a variety of new in-flight products Alaska is rolling out in 2017. In addition to a brand-new Premium Class service that launched this week, Alaska is introducing a number of enhancements which guests can enjoy from any class of service. Though these products are currently limited to flights operated by Alaska Airlines, customer response and feedback will inform future cabin enhancements and offerings on Alaska Airlines, Virgin America and Horizon Air-operated flights. "Gotta love it when your favorite airline just keeps getting better," said Russell Wilson, Seattle quarterback and Alaska's chief football officer. "I can't wait to try Free Chat on my next flight – now I can chat with my baby when I'm on the road, and stay connected to the team when I'm traveling for fun." Free movies through March: To celebrate its recent merger with Virgin America and the concept of "Different Works," Alaska is offering free, unlimited access to its entire catalog of entertainment available to stream on guests' devices, including Hollywood movies and popular TV shows through March 31, 2017. New titles available to view in January include Hollywood hits Nice Guys, Mike and Dave Need Wedding Dates, X-Men Apocalypse, and Ice Age Collision Course. Upgraded food and beverage options: Later this month, guests will begin to see new food and drink options on the snack and beverage cart when they travel, including new premium wines from Washington State's award-winning Chateau Ste. Michelle, as well as new premium craft beer, bourbon and a sure-to-be-favorite: sparkling wine from La Marca. Premium Class: Alaska's new class of service debuts this week on select routes. In addition to four extra inches of legroom, passengers seated in Premium Class enjoy early boarding and complimentary snacks and alcoholic beverages. More than 40 percent of Alaska's fleet has been retrofitted with the new section, and by year-end, more than 90 percent will feature this new class of service. "We've spent the past several years really investing in Alaska's fleet and onboard product," said Harrison. "By the end of this year, we'll have outfitted nearly half of our 737s with new, larger overhead bins with room for 48 percent more bags; most of our mainline aircraft feature custom Recaro leather seats with 110-volt and USB power at every seat; and we have the youngest airplanes of the top five U.S. airlines. This week's enhancements are just the beginning of the new features and promotions guests can expect to see us implement over the next year." Upgrades to Alaska's new Premium Class range from $15 to $79, in addition to base fares, and can be purchased at the time of booking through alaskaair.com or Alaska's mobile app, during check-in, and at the airport. Alaska Mileage Plan MVP, Gold and Gold 75K members are eligible for complimentary upgrades into Premium Class at the time of booking, or up to 24 hours in advance of travel, depending on status and the fare purchased. Learn more about Premium Class at alaskaair.com. Premium Class is not currently available on flights operated by Virgin America or Horizon Air. Free Chat launches in beta today, with full functionality deploying Jan. 24. To be among the first to try Free Chat, guests will simply need to sign into their Gogo Wi-Fi accounts and follow a few easy steps to begin chatting on their devices. Alaska is the first and only U.S. airline to offer this complimentary feature to all guests. Complimentary streaming entertainment options are available through the end of March 2017 on fliers' own devices; promotion does not apply to tablet rentals. Alaska Airlines, together with Virgin America and its regional partners, flies 40 million customers a year to more than 118 destinations with an average of 1,200 daily flights across the United States and to Mexico, Canada, Costa Rica and Cuba. With Alaska and Alaska Global Partners, customers can earn and redeem miles on flights to more than 900 destinations worldwide. Learn more about Alaska's award-winning service and unmatched reliability at newsroom.alaskaair.com and blog.alaskaair.com. Alaska Airlines, Virgin America and Horizon Air are subsidiaries of Alaska Air Group (NYSE: ALK).